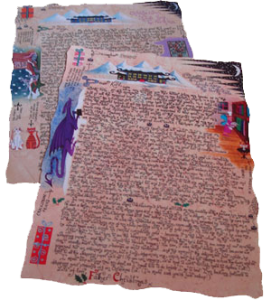 Rather unconventionally for the world of children’s fiction, much of my time is not spent on writing books, but letters. Father Christmas letters to be exact, for which I’m best known. Over the last ten years, they have been enjoyed by thousands of children all over the world. Originally, they were personalised and sent out to order via a small business called Rooftop Post. Today, I still make one or two of them available on Rooftop Post’s website as free downloads and every Christmas, visitors flock to the site to print them out for the little ones in their lives. If you have found yourself on my website because you are looking for Christmas letters, you might like to know that I supply Rooftop Post with new ones to make free in November and December. For the latest “before Christmas” letters, you should keep an eye on this page. You can also keep up to date with whatever I’m creating on my Musings page. Along with my co-writer, Keith Dando, I have now written and illustrated three children’s books: Santa’s Cat, The Secret Life of Grandma’s Cat and Grandma’s Cat and the Silver Planet. They are all available worldwide in Amazon’s Kindle store. The most popular has been Santa’s Cat, which is a picture book aimed at children aged 4 and above. We are currently working on a new picture book for the same age range, which we hope to finish by Easter 2020. View my author profile on amazon.com. View my author profile on amazon.co.uk.